Gravitational waves are ripples in the fabric of space-time that propagate outward from the source that created them, travelling at the speed of light. As a gravitational wave passes an observer, that observer will find spacetime distorted by the effects of strain. As the wave passes,distances between objects increase and decrease rhythmically, corresponding to the frequency of the wave. In very simple words, it distorts your shape – stretching and squeezing you in the direction the wave is travelling! The tale of gravitational waves is a long one. Albert Einstein is commonly praised for bringing forward the idea of gravitational waves when he published his ‘General Theory of Relativity’ in 1915. However, gravitational waves were first proposed by Henri Poincare ten years prior to that! Space-time is a mathematical model that joins space and time into a single idea called a continuum, and massive objects warp space-time around them. According to the general theory of relativity, curvatures in space-time are due to the presence of mass: the more the mass, the greater the curvature of space-time. In certain circumstances, massive accelerating objects can cause ripples in this curvature, and these ripples travel outward as gravitational waves. Stars exploding asymmetrically, coalescing neutron stars, or two black holes orbiting each other and colliding, are some examples of causation of gravitational waves. Two neutron stars/black holes rotate around each other; the closer they get, the faster they spin. Eventually, they collide. The energy from their spiraling and merging releases energy in the form of gravitational waves, or ripples in space-time. This calls for extremely sensitive detectors! Recently, the development of sensitive instruments that use interferometry (merging two or more sources of light to create what’s known as an interference pattern) has facilitated the creation of sensors which can detect tiny amounts of gravitational radiation. Currently, the most sensitive one is called LIGO – Laser Interferometer Gravitational-Wave Observatory. By initiating LIGO’s construction 20 years ago, humans took a giant leap towards the dawn of a new era in astrophysics. 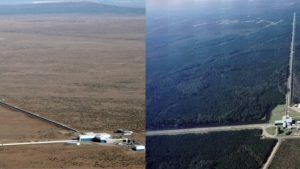 There are two LIGO observatories which have been functional since 2015. A single LIGO observatory has two arms, each 4 km long and perpendicular to each other. Laser beams are shone along these arms, which reflect off mirrors at each end. A passing gravitational wave will slightly stretch one arm as it shortens the other, and allow the detection of waves as shown in the diagram. The two arms of the observatory are stretched and compressed as a gravitational wave passes through them and is detected. After a hundred years of mathematical and theoretical proofs, the physical evidence arrived in the form of twin tremors in two detectors that were 1,865 miles apart. On September 14, 2015, ripples through space-time sent quivers down the L shaped arms of a detector in Louisiana. Only a fraction of a second later, another detector received the tiny-amplitude waves in Washington. The origin of these waves was a black hole merger 1.3 billion light years away! Since then, a few more gravitational waves have been detected, produced by other black hole mergers. Consequently, the 2017 Nobel Prize in Physics was awarded to Rainer Weiss, Barry Barish, and Kip Thorne for their significant contributions to LIGO, adding a new chapter to their decades-long quest to detect gravitational waves. However, an even bigger discovery was yet to be added to this tale. On August 17, 2017, a massive event in the heavens caught the eye of more than 70 laboratories around the world. Two neutron stars merged 130 million light years away in a cataclysmic collision that not only released gravitational waves but also a bright gamma-ray burst. The detection of this once-in-a-lifetime event was revolutionary for humanity; in addition to being noticed by LIGO, it was simultaneously photographed by optical telescopes, allowing us to see the explosion as well as detect the waves. Cross checking different data from different telescopes, such as the Swope telescope in Chile, confirmed the nature of this explosion and enriched our understanding of this groundbreaking phenomenon that was detected worldwide by showing that the explosion released tonnes of gold and other heavy metals. We not only saw gravitational waves and gamma rays from the event, but also light in other portions of the electromagnetic spectrum – such as optical and infrared light, gathered by the telescopes like the Swope (Source: Comstech). The story is far from over: with each advancement in technology, we will open a new chapter in this saga. said Rainer Weiss, the physicist at MIT who shared Nobel Prize in Physics with other members of the LIGO team. With countries like Japan and India planning to build their own gravitational wave detectors, and European Space Agency intending to send an observatory into space to detect far weaker gravitational waves than is possible on Earth, we are embarking on a journey into the known as well as into the unknown, and there is an excitement about what we are yet to learn about the cosmos, and our place in it. Hafsa Ahsan is an A levels student at Lahore Grammar School 1A1. As an ardent science lover, her interests include physics, mathematics, and astronomy. She is often found obsessing over Star Wars and reading books.